If you have irises growing in the garden, they should be coming along nicely now. Together with peonies and lilacs, they are among the Big Three of May blossoms. 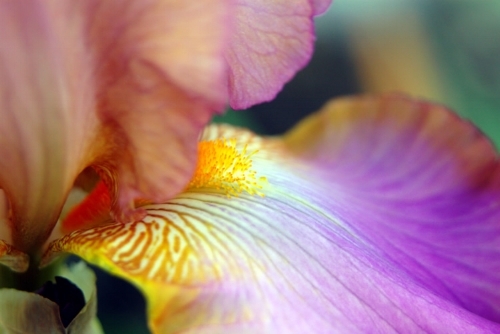 Irises have been favorites for a long time and in many parts of the world. For starters, they are said to have inspired that favorite motif of French heraldry, the fleur-de-lis. Oh, sure — all you Francophiles out there are going to say that a literal translation of the term suggests that it was the lily. But listen to the story, and I'm sure you'll agree it couldn't be so. Apparently Clovis, King of the Franks 'way back when, had been leading his army against the Goths, invaders from the north. During the fray, Clovis' troops were backed up against a broad river that presented the only line of retreat. The king eyeballed the situation and spotted some tall, yellow flowers growing in the water a fair distance from shore. "Aha!" he said. "They can't be in deep water. I do believe this river is shallow enough to be forded." His horticultural deduction was correct and his army fled safely across the river to fight another day. The plant in question could only have been the yellow flag iris (Iris pseudacorus), which must have plenty of moisture and can indeed grow in shallow water. Name me a true lily that could cope with those conditions. Naturally, Clovis wanted to celebrate his quick thinking. The next time the royal banner-makers whipped up some doodads for the troops to carry, the king suggested his fleur-de-lis emblem and a tradition was born. Or so they say. The irises we know today come in several nationalities, and I do believe the French have fought most of them. There are the Germans, the familiar bearded kind with sword-like leaves; the Siberians, which carry their flowers atop a huge mound of rushy foliage; the Japanese, another water-lover that bears the largest flower in the genus; the Spanish and the English, which generally come in white, yellow or blue with a prominent orange splotch on the petals, and the Americans, including a wide variety of charming woodland types. Clovis and the boys aside, I've always associated iris not with war but with diplomatic alliance, also known as friendship. I've given away so many irises over the years that they are now everywhere throughout the length and breadth of the land — proving that there's more than one way to conquer a kingdom. When I moved to my property, old clumps of bearded (German) irises were dotted all around the place. I dug them up and planted them out in rows to see what I had, and for several seasons my yard looked like an iris test garden. Such is the price of mania. After discarding the degenerate types with muddy colors, I still had wads of nice ones. The flowers have two parts: "standards" being the upright petals and "falls," the drooping lower petals. Mine had white, lilac or yellow standards with deep purple falls, and came in single colors of purple, lilac, white and pure gold. I began to give them away, and have never really stopped, although the mighty torrent now has slowed to a trickle. People who adopted my irises years ago are now giving away excess clumps of their own, so the saga goes on and on. They're just about to come into flower and I guarantee that I will soon have occasion to hear, "Your irises are doing well this year," or "How come they're not blooming much?" or "Should I divide them now?" This reassures me that while my irises are gone, they're not forgotten. If someone presses a handful of fleshy bearded iris roots on you (the the most familiar kind), here's my standard advice: Irises want full sun. They are highly drought-tolerant and can take dry sites. Don't plant them in a soggy spot or the thick root will rot. When you're planting or transplanting, cut back the foliage to 3 or 4 inch "fans," so the plant isn't too top-heavy. The thick tuber-like root should be planted right at the surface, so dig a shallow hole with a mound of soil in the middle. Spread the roots and bury the stringy ones but leave the top of the fleshy tuberous thing exposed. New growth will occur in the direction of the fan of leaves, which generally projects from one end of the root. Plant these facing outward in your clump or you'll have a terrific traffic jam in time. Iris will appreciate a handful of lime worked into the soil. I don't notice that they really need fertilizer, and the phrase "thrives on neglect" was never so true. The correct time to be planting irises is July through September when the soil is warm enough to promote new root growth. Spring transplanting doesn't work (I've tried) and is very likely to kill these irises — the foliage turns a ghostly white just before the plant croaks. When the clump becomes overgrown and congested, it's time to divide. Dig up the plants, discard any portion of the root that feels soft or looks funky, and cut them apart leaving one to three fans per root. Replant what you have room for and give away the rest, putting a new twist on the old saw "Divide and conquer." ROAD TRIP: Try to catch peak bloom this month at the Presby Memorial Iris Gardens in Montclair. The “Rainbow on the Hill,” a national historic site, features more than 10,000 irises. Spectacular!